Virtual Paintout - The Azores! I've participated in the Virtual Paintout for almost a year. 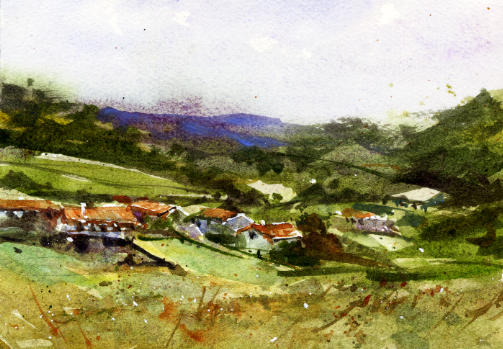 Still having a great time searching for a view to paint using Google Street View. Bill Guffey created the Virtual Paintout. Each month he chooses a location the Google cameras have covered for the Street View. Artists choose a view to draw or paint and Bill posts all of the submissions on his blog and on Facebook. It's so much fun to see what the artists have found to paint and the variety of painting styles. For June 2013 the location was the Azores, nine islands off the coast of Portugal. It seems like I spent even more time than usual looking around. I painted two small watercolors. Looking forward to where the July location will be! I don't know how wide-spread Jacaranda trees grow but here in Southern California many neighborhoods look forward to their annual blooms. In South Pasadena where I live there are a few streets which are lined with the purple flowering trees. Some years it's a spectacular sight when they all bloom at the same time. This year the trees' flowering seemed to be more scattered. 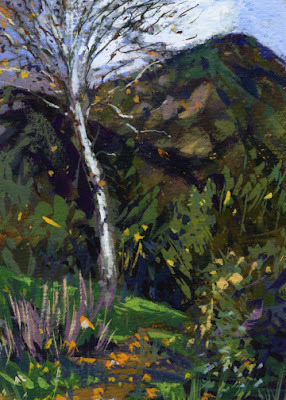 Of course the plein air artists were watching the leaves turn yellow as the purple buds formed. The neighborhood where we met for our paint-out also had some activity as an added treat. There were some workers with a small cement mixer. They kept coming and going with wheelbarrows full of cement. Up and down a driveway, many loads of cement. I had just visited a show at the Pasadena Museum of California Art titled California Scene Paintings 1930-1960. The timeless looking men with the wheelbarrows would have been the perfect subject for a typical "scene painting". 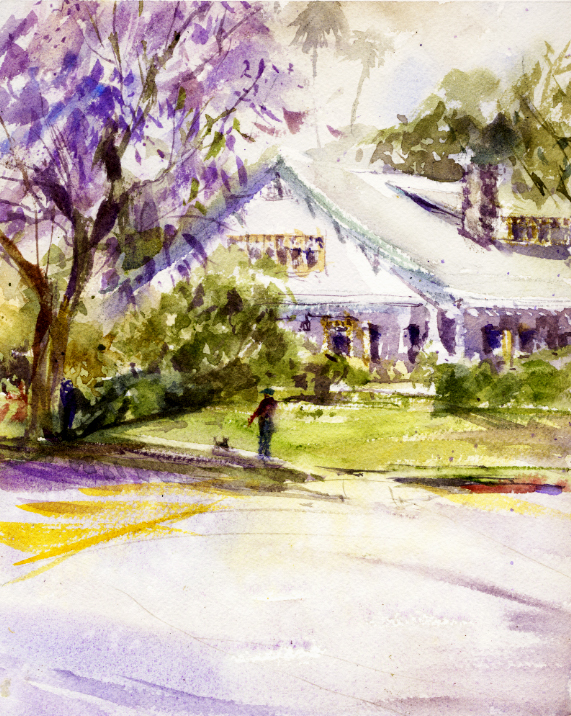 I wanted to paint the Jacarandas since I had been looking forward to it for some time and chose an interesting corner home with a Jacaranda tree in front. Recent springtime plein air paint-outs were at the Wrigley Mansion in Pasadena. Since 1958 the Wrigley Mansion has been the official headquarters for the Tournament of Roses which organizes the famous Rose Parade on New Years Day. It was one of chewing gum magnate William Wrigley's homes, and his wife's favorite since she could watch the parade from her front yard. 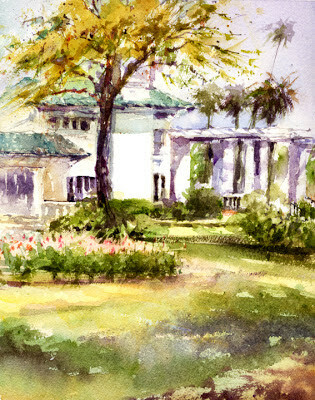 They purchased the adjoining property in 1915 to make a 4.5 acre garden which is magnificent today. What a great place to paint in the spring. It wasn't too hot and the roses were gorgeous. 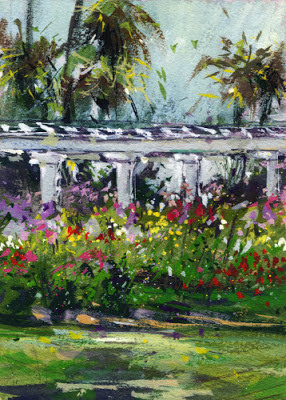 There is a beautiful curving pergola which features the large rose garden on the west side. It's an official garden for the American Rose Society and has 1,500 roses. Just beautiful. Our Saturday group met at the mansion and we all chose to paint on the south side. It was a beautiful day and I felt OK about my painting. But the next time I had my painting bag out I noticed I had left my eraser at the mansion. 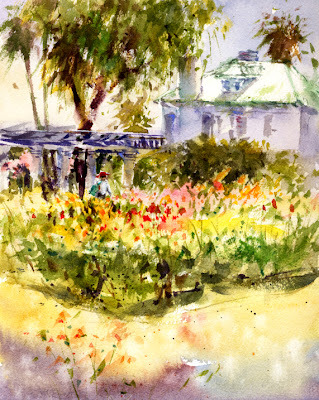 Well, the following Friday the group painted in the main rose garden area. I went back to where I was on Saturday and found my eraser! That day I tried painting the roses and did two pieces, a watercolor and smaller gouache. I'm finding the gouache to be a lot of fun after it starts coming together. The Virtual Paintout Lido Di Jesolo, Italy! 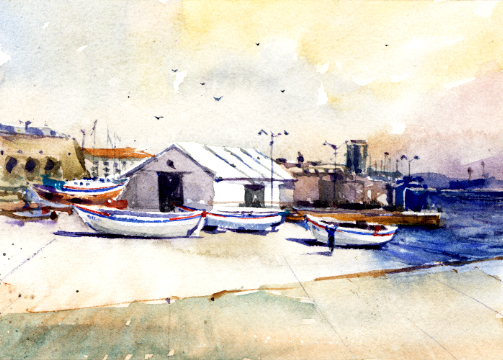 The Virtual Paintout for May was the 10th I've enjoyed participating in. I started actually painting some pieces from my browsing when I started this blog. Writing about it all made it even more fun. 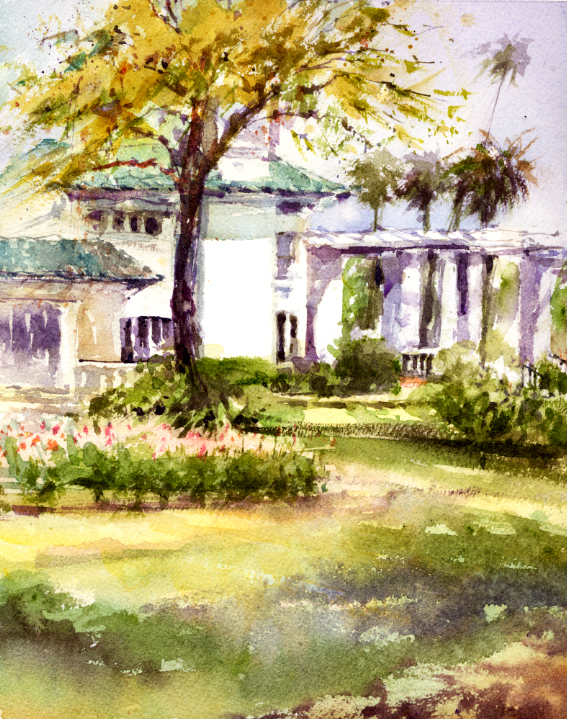 Bill Guffey created The Virtual Paintout and he selects the monthly locations. 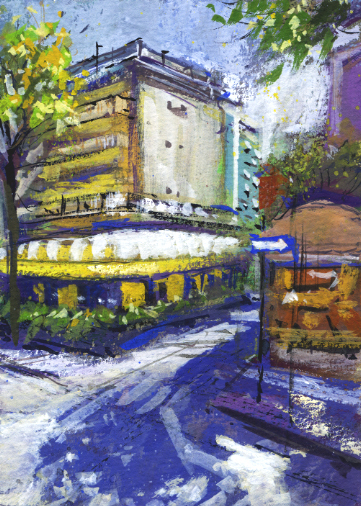 Artists virtually go to the location for the month and use Google Street View to find their view to draw or paint. Bill posts everyone's work on Facebook and his blog. I think it's so interesting to virtually look around cities and countrysides all over the world, wherever Google has covered with the Street View. The location for May was the Lido di Jesolo in the province of Venice, Italy. There were some farming areas but the main street looked very exciting. The Lido di Jesolo depends on tourists who come for its 9 mile long beach. The many hotels are only a few feet from their private beaches. I always have to stop looking around these beautiful locations and start painting before the end of the month. 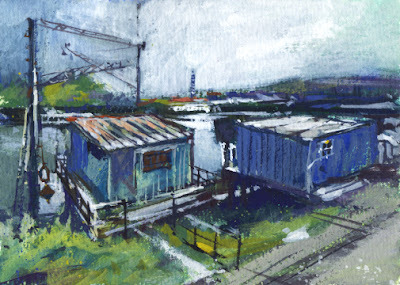 I painted 2 small gouache pieces from this exciting place. I could title this post "South Pasadena". 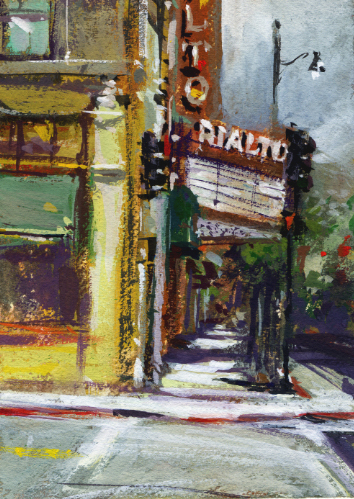 I'll post two paintings done in South Pasadena, but the "center piece" is the Rialto Theater where we had a recent plein air paint-out. 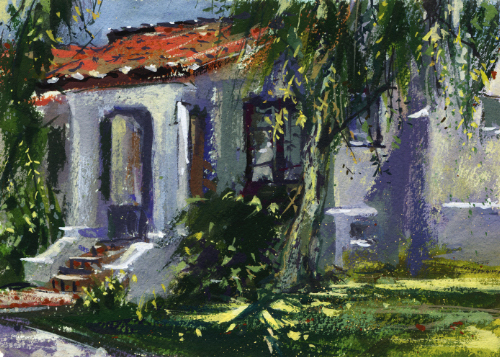 I've lived in South Pasadena since 1973 so it was an exciting week when all three plein air groups that I meet with chose locations here! The Rialto Theater is a center piece in our town but it has been crumbling for many years and needs help. Built for movies as well as Vaudeville, its opening was in 1925. There was a Wurlitzer and orchestra. When the Rocky Horror Picture Show came to the Rialto in 1978, it was still shown at midnight until the theater closed in 2008. The city wants it restored and revitalized but no one has stepped up to do that so the landmark sits in a terrible state of disrepair. The old Rialto is a nice subject for plein air painters, and who knows what its future will be. I painted it in gouache at 5x7". Two days later the Saturday group painted at various spots around one of South Pasadena's interesting intersections. There is the post office, two churches, a rooming house, a patio cafe, and a performance theater. I painted part of the Fremont Centre Theatre building that had some beautiful light and shadows that morning. It's also a 5x7" gouache. I didn't realize that so many people I know would drive by and walk by while I was painting! May was the month for the paint-out groups to paint the striking Matilija poppies. In April we were all in the gardens painting the red poppies. It turns out that the white Matilija poppies are native to Southern California and Mexico. They bloom here in spring and summer, and are also known as tree poppies because they can grow to 8 feet high. The pretty, silvery blue-green leaves are large and deep-cut. Of course the flowers are what we painters love. The fluffy white flowers get to five inches across with large, intense yellow-orange centers. Their name "fried egg" poppies fits well. My first plein air try with the poppies was a small patch of them at Bailey Canyon Park, in Sierra Madre. 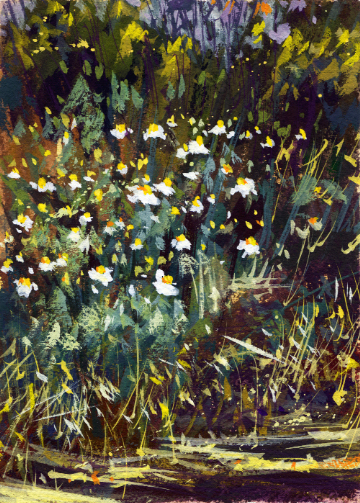 I thought a gouache piece might work best considering the white flowers. I also painted a piece with transparent watercolors. 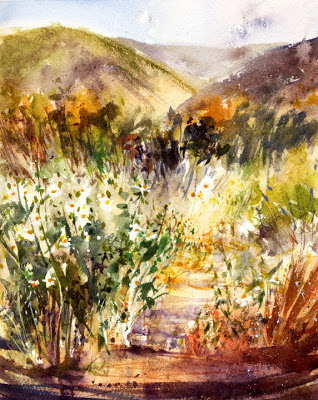 I'll add a small gouache piece I painted in February at the same place when there were no poppies blooming. There are more Matilijas to come! 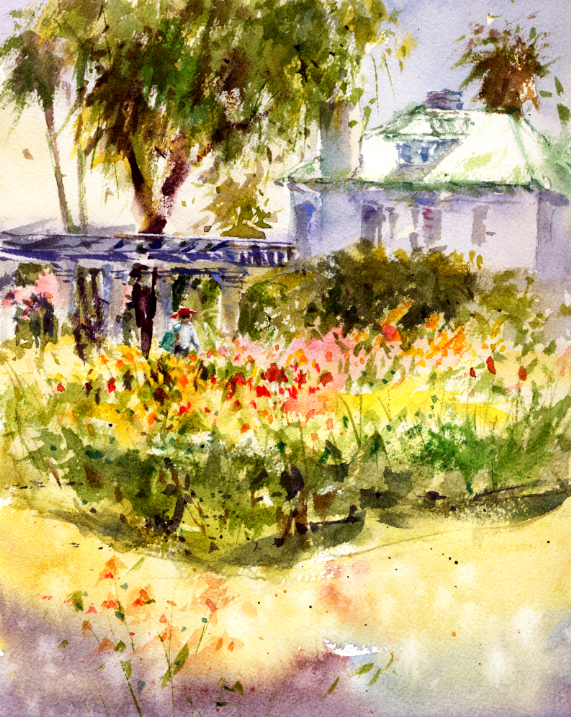 It was a very busy day at Descanso Gardens for our plein air paint-out. Spring Break for some schools and the gorgeous spring flowers brought quite a few busloads of kids and sight-seers. 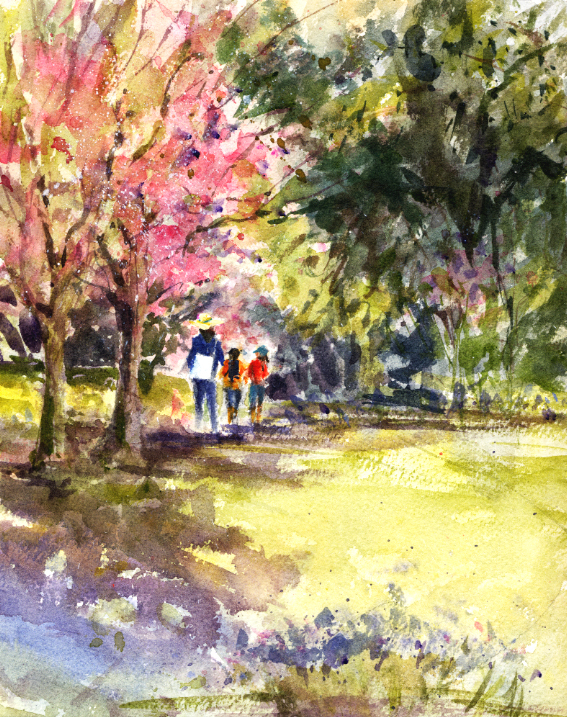 There were a few from our group painting in some other areas but five of us decided to stay on the Magnolia Lawn near the entrance. The small lawn area is protected from the main walkway into the gardens by a lovely espaliered "fence" of trees. It feels secluded, and the best part was that a few magnificent cherry trees were blooming there. The bright plink blossoms were at their peak! Wow! It was "raining" pink petals. I tried painting the cherry trees in watercolor. I knew it would be difficult to capture the brightness of the pink petals with transparent paints. I also painted a small gouache, 5x7" from my painting spot. 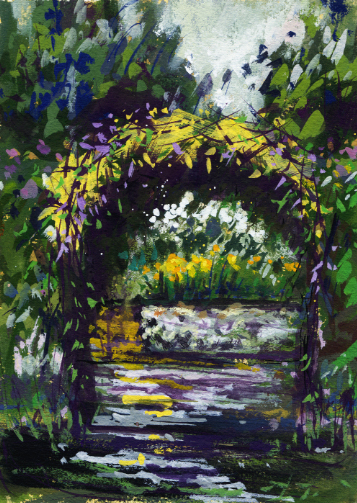 It's looking out through an archway from the lawn toward a planter planted with California poppies. Thinking about it now, I should have tried the trees in gouache and the archway in transparent watercolor. The group will be returning to Descanso and I know I'll have opportunities to paint more views. I received an email from a new-to-me paint-out group. 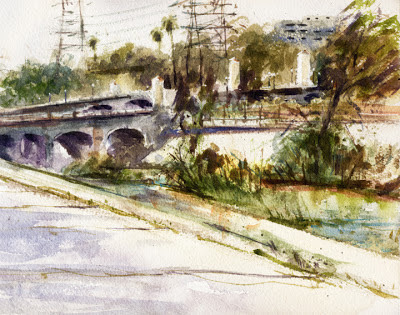 They were meeting at the L.A. River, officially the Los Angeles River. An exciting location! The rivers flows almost 50 miles through Los Angeles County. It's in the news frequently for one reason or another. It has been featured in many movies, but it also suffers from pollution and urban runoff. There is a revitalization project which has been active for several years so the river is becoming beautifully restored. It was a sunny day for our paint-out and the view from the meeting spot was wonderful. To the south is the Glendale-Hyperion Bridge, completed in 1929, which spans the river and a freeway. I personally like electrical transmission towers and there were a lot of those together with lush vegetation and stunning egrets and herons. I wanted to paint the landmark bridge from a little closer but there weren't any fellow painters walking south that far so I stayed with the group. I haven't painted a complicated bridge before but I had fun with this piece. 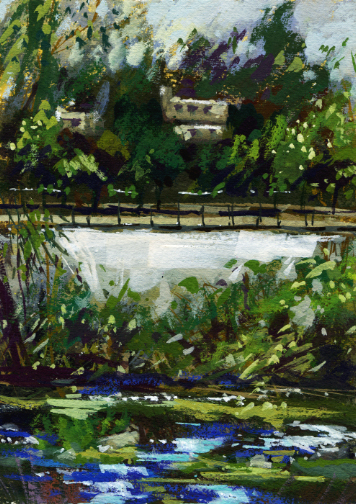 I also tried a gouache looking directly across the river. Since 2012, with the remodeling of Disney California Adventure Park, there is now a small-scale replica of the Hyperion Bridge which the Disneyland Monorail travels across. I'll add a photo from a recent visit.